Publish Now! is a division of Publish In Paradise offering publication consultation services for authors who wish to publish their own books as well as businesses and organizations looking to publish newsletters, journals, catalogs and more. Are you an author who wants to publish your own book to retain your rights and your profits? Do you have a business or organization looking to publish a newsletters, journals, catalogs, website, or other publication. ​Are you in need of direction on preparing your book or project for publication? ​If so, you are in the right place. We have several years experience in all aspects of publishing books, magazines and other media. We will walk you through from conception of your book idea to the birth of your published book. There are steps-to-success in publishing your book and getting into the hands of millions of readers. 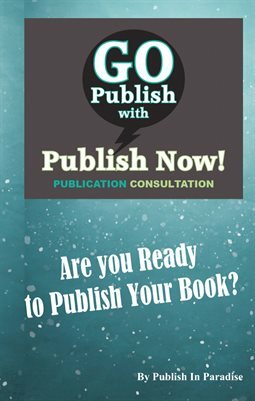 Is your book ready to publish? Are you missing a step? In this mini-book, we do a walk-through with you to make sure you are not missing a step before you publish your book! Offering resources to have your manuscript professionally edited and proofread. Even editors need editors, do not skip this important step to having a polished manuscript. We offer our own services at a discount to our Publish Now! clients or can direct you to other services and even do-it-yourself options to prepare your book for publication. This is where the hard work begins--getting all things ready to go publish your book to the world. This includes marketing and publishing your book in digital and/or print formats.